Starting around the Great Recession, the United States steel industry was facing an influx of low priced foreign steel. It was fighting back with one-off trade cases and winning, but the current president`s tariff regime provided a blanket benefit. Now, with efforts in Washington D.C. to reign in the president`s tariff powers, there`s a fear in the industry that tariffs could fall -- and once again expose U.S. steelmakers to rising imports. Here`s why that could have a major impact on industry players like Nucor (NYSE:NUE), United States Steel (NYSE:X), AK Steel (NYSE:AKS), and Steel Dynamics (NASDAQ:STLD)... and its not just about steel prices. Steel imports have been a major headwind for U.S. steel mills for a number of years. Imports hit a recent high of 40.2 million metric tons in 2014. The problem for the industry is that it believes the steel entering the U.S. market is being sold below cost, using a practice known as dumping. It has been fighting back with trade cases, explaining that foreign governments are unfairly subsidizing their steel industries. The U.S. steel industry has been winning those cases, leading to notable declines in imports in 2015 and 2016. ...between the tariffs, and the cumulative impact of the trade cases the industry has won in recent years... unfairly traded imports to the U.S. market have declined significantly. Increased demand levels and lower imports generated approximately six million tons of added volume for the U.S. steel industry last year. However, CEOs from some of the largest U.S. steelmakers descended on Washington recently to urge lawmakers to maintain the tariff regime. U.S. Steel CEO David Burritt, for example, told senators at a hearing on tariffs that, "Now is not the time to blink." He warned that even our closest trade partners can be conduits for unfairly priced steel from other countries. The easy takeaway is that U.S. mills like the tariffs because they protect the U.S. market and allow steel companies to keep steel prices high. But here`s the thing: The U.S. mills aren`t all that worried about steel prices. During a recent CNBC interview, Nucor`s Ferriola was asked about prices. He explained, using hot band steel as an example, that steel prices did rise when tariffs were put in place, but said they have since fallen back below where they were prior to the tariffs. He suggested that a strong economy in 2018 was far more important with regard to prices than the decline in imports. Which gets to the core of the issue for steel companies. Steel mills are large structures that cost a lot of money to operate. Those costs don`t vary proportionately with production -- just turning on a mill comes with massive costs. Once those costs are covered, however, steel mills can be very profitable. While price is important, volume and utilization are the issues that has steel CEOs so concerned. This is particularly true for companies like U.S. Steel and AK Steel, which rely heavily on blast furnaces. These mills tend to have higher costs than the electric arc mills that make up the core of Nucor and Steel Dynamics` businesses. To simplify a complex issue, electric arc mills are more flexible and easier to ramp up and down than blast furnaces, an older technology. If volume falls away, companies like U.S. Steel and AK Steel could quickly fall into the red. Nucor`s Ferriola noted the issue in the quote above, when he said that lower imports allowed U.S. mills to benefit from six million tons of added volume. To look at this a different way, imports accounted for 32.6% of the U.S. market in 2017, but just 28.3% in 2018. That drop meant that U.S. mills were producing more steel. More steel production means higher utilization, and profits naturally follow because the high costs of running a mill get covered by sales revenue. Every added dollar of sales above the cost of running a mill is a dollar that can flow more easily to the bottom line. This is vital today because steelmakers like Nucor, Steel Dynamics, and U.S. Steel are starting to build new facilities and bring once shuttered mills back online. The expectation is that growth in demand will keep the industry running at the high utilization rates that allow for robust profitability. But this means that capacity is heading higher. If tariffs go away and imports increase, that new capacity will turn into another headwind. New capacity could, effectively, turn the loss of tariffs into a double whammy. Tariffs are a very important factor today if you are watching the steel industry. However, they aren`t necessarily about propping up steel prices. Of equal, or perhaps more, importance is that tariffs have allowed U.S. steel mills to keep a larger share of the relatively strong domestic steel market to themselves. Should these protections end, U.S. steel companies will suffer because of the impact on steel prices for sure, but more so because they will see the utilization of their mills decline as foreign steel displaces domestically produced product. That will make it harder to turn a profit because of the high costs of running a steel mill. If tariffs do fall away, investors should look to companies like Nucor and Steel Dynamics because of their use of electric arc mills, which will make it easier for these steel giants to adjust. 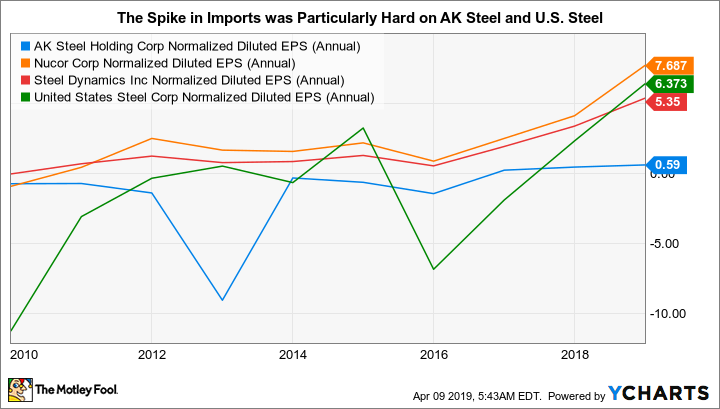 U.S. steel has benefited from government tariffs, and there could be big trouble if the tariffs end -- but it`s bigger than just steel prices. I just read that Warren Buffett, the world’s best investor, made over 99% of his massive fortune after his 50th birthday! It just goes to show you…it’s never too late to start securing your financial future. And The Motley Fool just released a new report that reveals five of our favorite stocks for building wealth after 50.